Includes horse and cattle trailers. Mocksville, North Carolina. Trailers ranging from Exiss and Sundowner aluminum horse and stock trailers to cargo and flatbeds too. Manufacturer offering a variety of trailers and coaches. Includes investor information, product line, trailer care tips, dealer locator, and FAQ. A broad range of equestrian products and services. Products include horse trailers, manure spreaders, stall mats, equestrian products, and trailer mats. Information about trailers to pull motorcycles and trailers motorcycles can pull. Distributor of boating and equipment trailers and their accessories. Produces a trailer designed to haul one or two motorcycles and stand up when not in use. Oklahoma dealer specializing in used pickups and light commercial trucks, as well as trailers for use with them. Descriptions of vehicles for sale, including photos. Supplier of trailers, vans, flatbeds, tankers via sales or rental. Supplier of parts for RVs, utility trailers, boat trailers, campers, motorcycle and Jetski trailers. Convertible ATV multi-use trailers and jeep trailers with accessories for hunting, fishing, canoeing, camping, and boating. Sells plans to build trailer with step-by-step instructions, full-size templates, list of suppliers, discussion message board, and photo gallery. A variety of product lines with numerous standard and custom build applications including horse, living quarters, stock, race car, open car and cargo trailers. Nationwide retailer with a complete line of trailer hitch & truck accessories including trailers, towbars, and everything for your vehicle. Welding and fabrication services including trailer repair, pipe and tube bending, and custom built trailers. Also custom builds stock cars. Description of services, contact information, map. Manufactures and sells stock, cargo, flatbed and horse haulers, also B&W trailer hitches, truck beds and accessories. Sells custom designed motorcycle trailers for cross country motorcyclers. Offers trailers to tow with motorcycles. Includes various optional upgrades and product specifications. Information and sales of custom designed motorcycle trailers for cross country motorcyclers. A wide variety of LED lights for trucks, RVs, campers, utility trailers and boat trailers. Manufacturers of enclosed motorsport trailers from 8 to 53 in length. Touring trailers to pull behind a motorcycle. Enclosed trailers for a variety of sporting vehicles. Sellers of utility, hydraulic and enclosed trailers. Sells enclosed race car and vending trailers. Replacement parts, products, contact information and prices. Line of trailers for all types of motorcycles. HitchDocker is a simple and inexpensive trailer hitching device that aides in coupling your units together. If the business hours of Trailers of the East Coast in may vary on holidays like Valentine’s Day, Washington’s Birthday, St. Patrick’s Day, Easter, Easter eve and Mother’s day. We display standard opening hours and price ranges in our profile site. We recommend to check out trailersoftheeastcoast.com/ for further information. 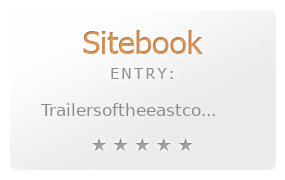 You can also search for Alternatives for trailersoftheeastcoast.com/ on our Review Site Sitebook.org All trademarks are the property of their respective owners. If we should delete this entry, please send us a short E-Mail.